First, where did you work as cabin crew? Six years with Aer Lingus and a year with British Airways CityFlyer. I enjoyed it. Like everything, there is good with bad but I certainly enjoyed my time. No two days were the same and the variety both with work and a huge variety of colleagues were all both rewarding and challenging. Rewarding as in being part of a team working towards a common goal, and challenging making the team work while having to deal with several days of very early starts, late finishes and, at times, long multi-sector days. All in all, it was an excellent introduction to the aviation world and what working on an aeroplane is about with all its ups and downs. Did it work as a means to reaching a pilot career? It provided a basic knowledge of the industry and opportunities for limited networking within the pilot community. It also gave me the confidence to proceed with committing to the significant expense of a flying licence as it confirmed my desire to pursue the career I always wanted. What was the most challenging part of balancing your pilot ambition while making sure you performed well in your job as cabin crew? Mainly finance. I could not sacrifice my job as cabin crew to pursue any flying training. 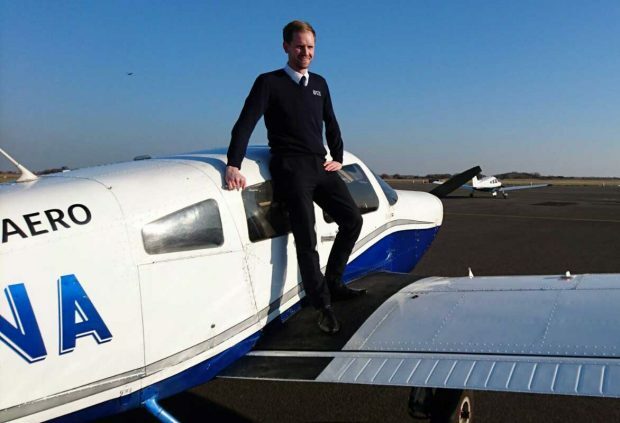 Given the randomness of the working hours, it was an impossibility to combine work and training for a professional pilot licence. What led you to select the Integrated Route? It is what I perceive as the best route with regards to airline recognition and securing a job. Why did you decide to train with CTC Aviation? From the pilots I worked with over the years, CTC Aviation was the name that most frequently came up in a positive light confirming my choice. What stage are you at in your training right now? Do you feel you have made the right decision? How have CTC Aviation and airline recruiters looked upon your experience as cabin crew? CTC Aviation invited me to give the speech at the RAeS based on my experience as cabin crew now pursuing a career as a pilot. At the event itself I received great feedback and support from the various airlines present. The event was a great experience for me and the first time I really felt that my background as cabin crew was recognised as an advantage to becoming a pilot. Do you feel that your experience as cabin crew (training, life experience, customer experience, etc) has set you in good stead for the rigours of pilot training? Yes, definitely. I find it easier to integrate with my peers and can relate a lot of what is being taught to real life events from my flying. Also, I have a sound understanding of what a pilot is all about and where a pilot fits into the entire operation of an airline, from working on board an aeroplane to dealing with passengers and public in the airport to liaising with crewing and other departments within the airline. Having worked on an aeroplane has also taught me the discipline and attitude required to get through the pilot training. What’s the next step for you in your pilot training and future career? The basic and advanced flying training followed by an MCC. Going forward, my aim is to secure a flying job with one of the partner airlines of CTC Aviation. What advice would you give to any other cabin crew who may be hoping to transition to a pilot career? Go for it! Be under no illusion that it will be an easy path. Having gained experience as cabin crew will stand positive and be a benefit to both yourself and the airline. What steps would you like to see airlines taking to make it easier for cabin crew/engineers/flight ops to transition to the flight deck? Develop a form of mentorship and harness internal talent. Comparing aviation to other industries where they often encourage people to develop and take charge of their career with the company. This both ensures commitment and dedication towards the company from the employee and it will enable the company to promote and develop suitable staff already within their organisation. This in turn may provide the company with a more dedicated workforce and greater predictability for recruitment needs and the type of person actually recruited for any position. Do you think there should be a standardised pathway from cabin to flight deck? Yes, or at least provide a pathway where the individual does not have to resign from a position to complete the training, then have to reapply at the same level as any other qualified person.